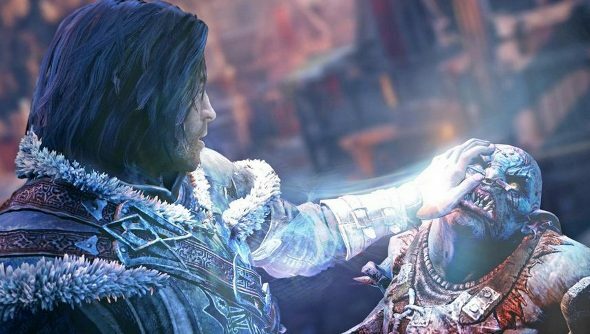 So we know Talion, Middle-earth: Shadow of Mordor’s tragic ranger protagonist, has this whole Russel Crowe from Gladiator thing going on, but only now are we getting the skinny on the wraith hitching a ride in his body. As Comic-Con, Monolith and Warner Bros. revealed that the wraith was actually Celebrimbor, who you’ll probably only know if you’ve read the Middle-earth bible, The Silmarillion. He’s a big deal, though, this elf. He’s the smith who fashioned the rings of power, making him one of the key figures in Tolkien’s fantastical mythology. This gives a bit more credit to co-writer Christian Antamessa’s claims that it that it’s built on the foundations of Tolkien’s books rather than being something entirely separate. He won’t be doing much smithing in Shadow of Mordor though, as you can see in the trailer below. So old Celebrimbor is less interested in making pretty magical rings for the leaders of the dwarves, elves and humans than he is in augmenting Talion’s combat prowess and messing around with the minds of orcs. Reading minds and turning the orcs against their fellows looks like a lark. Shadow of Mordor was pushed forward a week, so it’s due out quite soon, hitting North America on September 30th and the shores of Europe on October 3rd.